This uprising changed many of the political equations both inside Iran and at the international level. The world became aware of how the people of Iran long for freedom, justice, and equality. The Mullahs’ reaction to the uprising was that they resorted to their savage nature. They refused to respond to the legitimate demands of the people and instead began a new round of repression, by arresting thousands of the protesters, killing some in the streets by directly shooting at them or in the jails under torture. Contrary to the former revolts, this uprising advances on the shoulders of the toilers. The economic pressures have left no other choice for the people. Repression and crime have no effect on stopping the uprising. The people are keen to seize any opportunity as the Funeral Ceremony of the Popular Movie Star, unacceptable provincial visioning, or suspension of farmers’ right to water to protest and rise. There is, of course, another parameter. These uprisings are organized, the slogans and demands are similar and this stems from the force that leads the uprising. But who is this crucial force? On January 10, 2018, Khamenei admitted: “A triangle (of forces) have been involved in the recent events”; and he named the PMOI \ MEK as one side of this triangle. As the uprising surged, on calling the French President, Emmanuel Macron on Jan. 2nd, Rouhani asked him to take action against the PMOI, who have their headquarters in Paris. On Sep. 16, FM. Jawad Zarif asked Twitter to close Iran resistances’ accounts. During recent months, there has not been a day in which the regime and its lobbies abroad did not demonize the MEK in their articles, books or videos. The regime sees its overthrow in the success of the uprising. Therefore the Mullahs, endeavor full force to rein in Iranians’ determination to achieve freedom. But there is a parameter that prevents the repression from stopping the uprising. An organization that has undermined regime’s suppressive ability by offering its 40 years of experience in the struggle for freedom to the young generation and by organizing protests inside Iran as well as reflecting the voice of the Iranian people’s craving for liberation abroad. The continuation of the uprising, the nationwide strikes and the growing activities of the resistance units are the evidence of the debilitation of the regime’s suppressive power. The mullahs have perceived that demonizing the MEK and disseminating fake news about them will have no effect, thus to restrain the uprising, they seek the solution in physically annihilating the MEK. Of course, massacring the MEK is nothing new. Mullahs’ regime has murdered more than 120,000 freedom-lovers so far. The anti-human mullahs executed 30,000 political prisoners just within August-September 1988, most of them supporters of the MEK based of Khomeini’s fatwa. In his fatwa, Khomeini demanded immediate “destruction of the enemy”. Accordingly, all the regime’s agents were and are obliged to annihilate the enemies of the regime, the latest example of the implementation of this fatwa is the arrest of senior regime diplomat in Europe, who had personally delivered 500g of TATP to its mercenaries in Strasbourg. 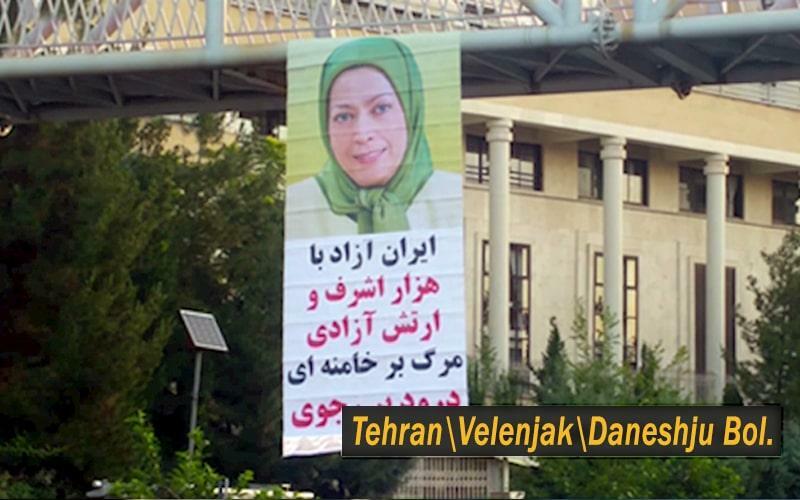 These mercenaries were supposed to bomb the Free Iran Gathering in Paris, while more than 100 thousand exiled Iranians, hundreds of the prominent figures from five continents of the world were present there to declare their support for Mrs. Maryam Rajavi and MEK as the main force of the Iranian resistance. This terror conspiracy was, of course, foiled in its latest stages by Belgian security forces and European cooperation. Eventually, this so-called diplomat was arrested along with other mercenaries in Belgium, Germany, and France. As Mrs. Maryam Rajavi has stated, the decisions for terrorist operations are made at the Supreme Council of National Security presided by Hassan Rouhani, and subsequently approved by Khamenei. Otherwise, regime’s senior diplomat could have never engaged directly in such a plot. Indeed this is not the first terror attack by the mullahs, for example, in the AMIA bombing case in Buenos Aires, the highest levels of the regime were involved. It is notable that these terror conspiracies recently discovered and foiled in Albania, France, and the United States, have all been conducted during Rouhani’s tenure, a fact that those countries who still are appeasing this polished front men for their short-lasting benefit must have in mind. No need to say that the regime’s oppressive apparatus and its MOIS continue physical removal of the MEK and their dissidents, what they have done from day one. Regime’s agents and so-called diplomats are tasked with the annihilation of its opposition everywhere. Thus, it is shameful for the EU governments to close their eyes on mullahs’ crimes for some fleeting economic interests. It is, therefore, the time for EU to stand firm against mullahs and their terrorist conspiracies. The EU must make the regime understand that it cannot turn Europe into a slaughterhouse for the MEK and its other dissidents. While the state-sponsor of terrorism is approaching its end, the EU needs to take a firm step to prevent the Iranian regime from continuing its criminal plots. Since the Iranian regime is providing the logistics and is covering up the terrorist operations through Iran’s embassies, the best decision would be to close down regime’s embassies in Europe as the first stage.